Erin Channing is heart broken when she learns that her beloved Aunt Kiki, who hadn’t spoken to her in over a year, has died. At a memorial service set up by Kiki’s friends, a mysterious woman gives Erin a strange pink crystal ball that once belonged to her aunt. The crystal ball comes with a set of puzzling rules which Erin sets out to solve with the help of her two best friends, Samantha and Lindsay. Erin wants to ask the crystal ball if she will be among the 5 students chosen for a trip to Italy. She is very logical, always having believed in what only the eyes can see. In her short life, she’s had very few experiences and thinks that going to Italy will change all of that for her. Samantha wants to know if she will get if the objection of her lust will dump his girlfriend and ask out Samantha. Lindsay wants the crystal ball to aid her in getting rid of her father’s girlfriend, who is only a few years old than Lindsay herself. The girls are amazed when everything they have asked for starts coming true, but the magic seems to come with a price as well. I was a huge fan of Ann Brashare’s The Sisterhood of the Traveling Pants series, so I knew that I would really like The Secret Society of the Pink Crystal Ball by Risa Green. It is a very quick read, with unique characters and drool worthy romantic interests–especially Jesse Cooper, Erin’s first kiss. Though they hadn’t spoken in 2 years, neither had forgotten what that kiss had meant to them, and watching them find a way back together was so much fun! The Secret Society of the Pink Crystal Ball also lightly touches on more serious themes, including bullying, the loss of a loved one, and strains in teenage friendships. I was so glad that Erin, Lindsay, and Samantha were able to overcome the obstacles they faced in this book, and I was thrilled to see that the ending left it open for at least 2 more books involving these feisty girls. I love books like this. Please enter me in the contest. I entered the Pretty Neat Giveaway. I like The Secret Society of the Pink Crystal Ball on Facebook. Thanks for the great giveaway! I have heard a lot of good things about this book and would love to win. Count me in! 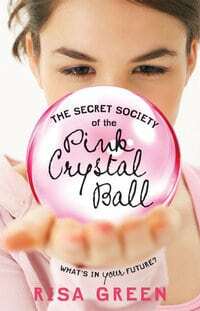 FB fan of “The Secret Society of the Pink Crystal Ball” (Laura Grassie Henderson). This would be a great winter read. Thanks! I like the OXO International Good Grips Black 6-PC Measuring Spoon Set at the open sky store.